It is tempting to imagine a viewer tuning in by accident at random points in the new BBC/Amazon film of “King Lear,” which sets the classic tragedy in a contemporary world of S.U.V.s on rain-slick roads and troops in fatigues, in which a climactic battle involves a hail of bombs and anti-aircraft fire and an ultimate duel becomes a bruising extreme-fighting contest. Would this imaginary viewer even know she was watching Shakespeare unless she listened closely to the poetic dialogue? Of course, in the age of streaming video, there are no accidental viewers anymore. 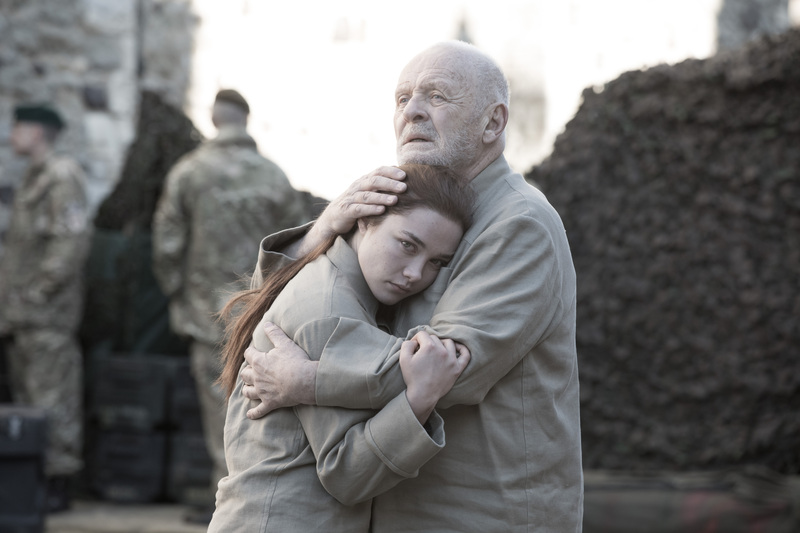 So the decision of director Richard Eyre to set this new “Lear” in the present tense cannot be seen as a mere trick or enticement for the classics-averse. And it is not simply a way to make the play seem freshly relevant, a favor it doesn’t need. What this approach achieves, better than many filmed Shakespeare adaptions I have seen, is to make a stage-bound play into something convincingly and richly filmic. It translates the action seamlessly into the visual syntax of countless political thrillers and potboilers, using both the intimacy of close-ups and the sweep of the long shot. Above all, it makes ideal use of a sensational cast of British actors who have not only the stage chops to fill these outsized roles but the crucial film experience to scale their performances for the camera. A new adaptation from the BBC and Amazon makes ideal use of a sensational cast of British actors. This starts at the top with Anthony Hopkins as Lear. Now a ripe and vigorous 80, Hopkins has a face as wrinkled as a well-used map and the gait of an eager goblin, and he knows as well as any actor alive how to let his unique physicality do at least half of his work or at least set the table on which he can feast. As the king who famously tests his three daughters’ love in an ill-advised inheritance competition, Hopkins appears to have obstinacy and bluster stored up like fuel in his body, and he spends the film burning fitfully through his supply till it is ash and embers, in a subtly calibrated performance that seems to utterly transform him from scene to scene. Hopkins is also a master of the abrupt, shocking outburst—the sudden bark punctuating a calm exchange—and for its first half, Eyre’s film runs on this syncopated rhythm: Well-dressed people converse with quiet concern in well-appointed rooms, where small flare-ups and slowly escalating aggressions break the decorum with unsettling force. Though both Emma Thompson, sleekly vampiric as Goneril, and Emily Watson, who makes a sly, dyspeptic Regan, rise to the full villainy of their roles, their initial reactions to Lear’s intemperate ravings have the recognizable look of adult children watching, with a mix of sympathy and horror, as an aging parent loses his mental grip. This Lear is an entitled jerk, and his daughters—excepting honest, upright Cordelia—are terrors. This is otherwise not a version with much sympathy to go around, as the conflicts ramp up from the domestic to the military. While I have seen productions of “Lear” that depict the daughters’ efforts to manage their spoiled father’s advancing senility as more or less reasonable responses to his irrational demands, Eyre’s production does not skimp on either side’s awfulness. This Lear is an entitled jerk, and his daughters—excepting honest, upright Cordelia (Florence Pugh)—are terrors. Two intertwining tragic threads, not plucked in every version of “Lear” but emerging strongly here, are the clear sense that this family’s deep dysfunction predates the action of the play and the realization that Regan and Goneril are in some ways no more than chips off the old block: tyro tyrants, mini-Lears. Apart from Hopkins, the film’s most affecting performance is Jim Broadbent’s as Gloucester, the Lear ally betrayed by one son, Edmund (John MacMillan), and rescued by the other, Edgar (Andrew Scott). Few actors register bewilderment better than Broadbent, with his gaping jaw and wide-set eyes. That he loses these expressive instruments to the manicured fingernails of Regan, in one of Shakespeare’s grisliest scenes, adds insult to injury. The scene in which Hopkins’s Lear, pushing a shopping cart full of junk and wearing a tattered coat tied with a rope, recognizes his old friend on a bus bench and sits to muse with him on the meaning of it all, may be the film’s high point and possibly the play’s. We are suddenly but somehow inevitably in the desolate neighborhood of Beckett and his hangdog hoboes. In this way, “Lear” is a prophetic work, not only in anticipating the aesthetics of 20th-century absurdism but in foreshadowing the doomsday cataclysms of the atomic age that inspired the likes of Beckett, Ionesco and Pinter. As the scholar Frank Kermode has noted, “Lear” is at least partly “a play about the end of the world,” depicting an utter breakdown of authority, family and dignity not only due to human violence and avarice but to the unforgiving cruelty of nature (that raging storm) and of time itself. I credit “Lear” with teaching me the essential tragic wisdom that we must live with the consequences of our actions, even after we have repented and been forgiven; Lear and Cordelia’s loving reunion does not prevent her death, let alone his. Eyre’s film underlines the point by putting her corpse alongside her sisters’ on a tumbrel—the sun setting on the evil and the good. These are the Job-like insights that make “Lear” as timeless as Scripture and that no amount of updating or interpreting is required to clarify. “When we are born, we cry that we are come to this great stage of fools,” Lear says in his colloquy with Gloucester. Our world is that stage, no less than it was in Shakespeare’s time. I should have done and did not do, but only empty horizons await me. It was a great movie that's worth checking out. It slightly relates to How Relationship With Your Parents Effects On Your Future Success. Thanks for writing about it!